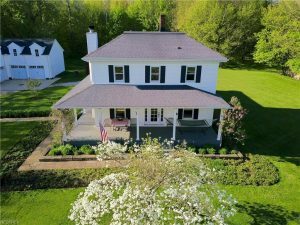 Completely remodeled and updated century home on 5.5 acres. Lots of charm and character. Original hardwood floors throughout, 9-ft. ceilings, wood trim and solid wood doors. Four bedrooms, 2.5 baths. Master suite with huge dressing room bath remodeled in 2018 and featuring glass shower and jetted tub. Separate 1700 sq. ft. two-story carriage house garage holds four vehicles plus workshop space. This building is heated and features a finished upstairs ideal for a home office or media room. There is also an income-producing building with overhead door on the property. Highlight and right click for more information……..